Tank Farms sometimes contain toxic or hazardous materials for processing plants or refineries. 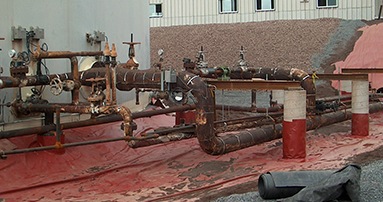 Special chemical-resistant geomembranes are used as a secondary containment system which line beneath the Tank Farms. The areas are built to be able to contain the volume of the contents in the tanks should there be a leak or failure.